A custom designed apartment located in the heart of the city, a 10 minute walk from Aristotelous Square! 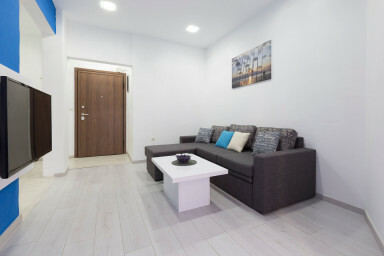 blueWave place is a custom designed apartment located in the heart of the city, just a 10 minutes walk from Aristotelous Square, minutes walk from the main shopping, sightseeing, and restaurants/ cafes. Walk Score of 99 out of 100: A Walker's Paradise so you don't need a car! Surrounded by history in a modern setting providing a perfect balance. The apartment features 1 bedroom (with king size bed, large closet and work desk), living room with a sofa (that sleeps 1 person), 1 full bathroom, and a small but fully equipped kitchen. It also features free Wi-Fi and cable TV (channels start at 100). Check-in and check-out is seamless by keeping the keys in a lockbox and showing you detailed instructions on how to get the keys on your own. Upon reservation, you will receive information for checking-in on your own so that you can arrive at any time after check-in time. Feel free to access and use the whole apartment with the exception of the locked areas/ cabinets. PARKING: There is plenty of street parking available in front of the building but it is only allowed after 8 p.m. and until 8 a.m. Alternatively, search for a nearby parking garage and we have plenty within a block from us. The best way to come from the airport is by taxi and it costs about 20-25 Euros. Great place to relax and decompress in the comfort of he living room.